The other day a new patient asking about a bridge called Los Algodones to ask for information about a tooth replacement, she was a first timer, and you could tell how anxious she was by her tone. What came to my attention was how much information she had, some of it good, other, not so much; she wanted to get a tooth replaced, but couldn´t make heads or tails of what her options were, she kept hearing about implants and bridges, zirconia replacements, and so on, and so on. For the purpose of this post, let’s say that teeth have two parts; the first one it’s called the root, and it’s the part inside your gum encased in bone and keeping your tooth affixed. The crown on the other hand is the exterior part that you normally see when you look at yourself in the mirror. Now, when a tooth is removed or lost, there are two ways we usually go about it. 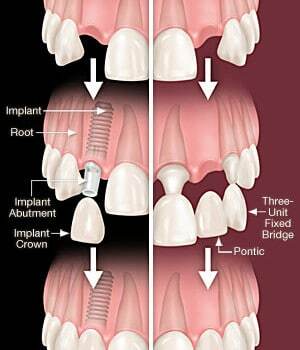 On one hand, we have the implant, which is a root replacement, in other words, the implant is inserted in the place where the root used to be, and a replacement crown is affixed. It’s as if you had a completely new tooth, with the caveat that the material used for the implant fuses with the bone, making it even more resilient. The other treatment is a fixed bridge, which is a prosthetic that is fixed in place by creating a “bridge” of sorts with the teeth next to it which hold it in place. The pontic (tooth to be replaced) is supported by its connection to the abutments (tooth on the sides). For this procedure the enamel (exterior of the tooth) of the abutments is replaced with a crown to which the pontic is attached created a solid interconnected structure of three teeth. There must be sufficient bone to support the implant, otherwise it might fall off, if this is not the case, a bone grafting procedure is required before the implant is placed. The adjacent teeth and gums must be healthy and preferably in good shape so the crown doesn’t stand out in comparison to the rest of the denture. Aside from that, it involves a small surgery and tends to be more expensive than the bridge. So, which one is the better choice? That’s a question that can only be answered in a one-on-one basis, your dentists needs to diagnose your current situation and help you pick the choice that suits your needs best. In the end it’s your health, and we as professionals have the responsibility to make the best job possible.